Integra LifeSciences' stock split in January. Was it an exercise in futility? 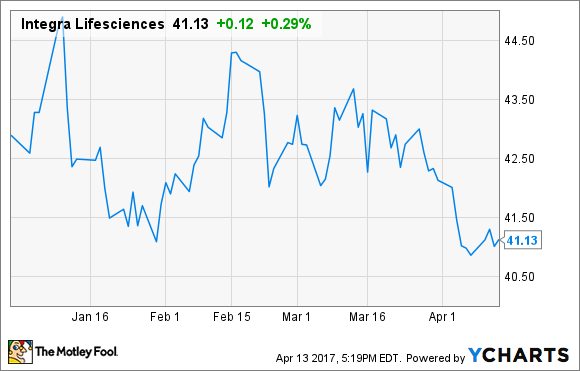 When Integra LifeSciences Holding Corporation (NASDAQ:IART) decided to do a 2-for-1 stock split on Jan. 4, 2017, the surgical products company no doubt thought the move would lead to a higher valuation of the stock. But it didn't. Companies do split their stock to make shares seem more affordable and hopefully generate more investor interest to drive share prices higher. So why didn't this idea work for Integra? To be fair, Integra's stock split seemed to have the desired effect at first. The following chart shows the initial jump in the share price. Note also that trading volume surged on the day the stock split took effect. Although volume fell the next day, it steadily increased over the the following days. This is a textbook example of what companies hope to see with a stock split. Higher investor interest. Higher stock prices. Everyone is happy. Unfortunately for Integra, it didn't last. Here's what happened after the initial bump. Why did Integra's stock give up all of its gains in one day? The company announced preliminary fourth-quarter and full-year 2016 results and its outlook for 2017 on Jan. 10. The preliminary earnings numbers weren't a problem. Integra expected earnings for both fourth-quarter and full-year 2016 to come in above the midpoint of the range previously provided. 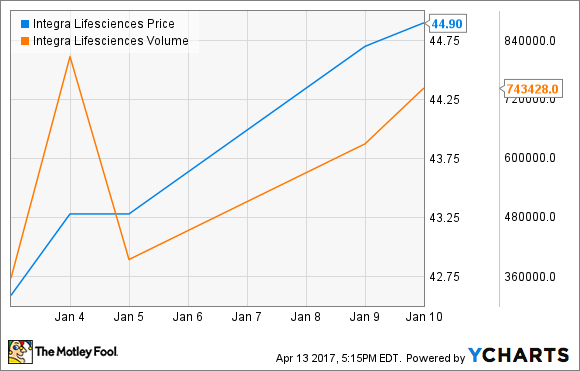 When the company announced the final earnings results on Feb. 23, those expectations proved accurate. Integra's earnings matched up with the consensus analysts' estimate also. But fourth-quarter revenue was lighter than anticipated. Integra's preliminary expectation for 2016 revenue of $992 million was on the low end of the guidance range previously provided. Investors were disappointed in this lower-than-expected figure. Integra also announced on Jan. 10 plans to acquire Derma Sciences Inc. for $7.00 per share. The purchase of Derma, with its amniotic tissue-based platform technology, should be beneficial for Integra over the long run by beefing up its regenerative technology capabilities and bolstering its wound-care strategy. However, Integra said that the deal would hurt 2017 earnings -- a factor that likely added to investors' near-term concerns. Still, after declining for a few weeks, Integra stock began to rebound. The share price didn't quite make it back to the initial highs experienced after the stock split, but it came close. Integra announced on Feb. 15 that it was buying Codman Neurosurgery from Johnson & Johnson (NYSE:JNJ) for a little over $1 billion. At first, there was a positive market reaction to the major deal with J&J. However, that early euphoria quickly wore off. Integra's share price began another decline that doesn't seem to have ended yet. What can investors take away from all of this? Most importantly, don't be concerned with temporary stock price gyrations -- or the gimmicks that can cause them. Stock splits can sometimes be smart moves, particularly when the stock trades at such a high level that the average investor can't afford to even buy a handful of shares. But Integra's share price wasn't nearly that high before its January stock split. A much better approach is to focus on the long-term prospects of the business. It's true that Integra's acquisitions of Derma and Codman will hurt the company's bottom line in the short term. What's more important is what impacts these deals will have on Integra over the next five years and more. Integra CEO Peter Arduini called the purchase of Codman from Johnson & Johnson a "transformational acquisition." He's right. There will no doubt be challenges. Integra must integrate operations across multiple countries. That won't be a piece of cake. The company is also increasing its debt load significantly, which comes with added headaches and constraints. Still, I suspect the Codman acquisition will pay off for Integra over the long run. Ten years from now, the purchase from J&J will appear much more important than the January stock split. In reality, it's already much more important.